Several prominent Champaign County residents and officials gathered to wait tables for charity on Tuesday at Coppertop. Justin Miller | Urbana Daily Citizen Champaign County YMCA CEO Paul Waldsmith and his daughter Ellie wait on customers at Coppertop on Tuesday. Several prominent Champaign County residents and officials gathered to wait tables for charity with tips benefiting the Cancer Association of Champaign County (CACC). The CACC raised $3,917 in tips and $725 in raffle ticket sales for a total of $4,642. The event served 189 meals. 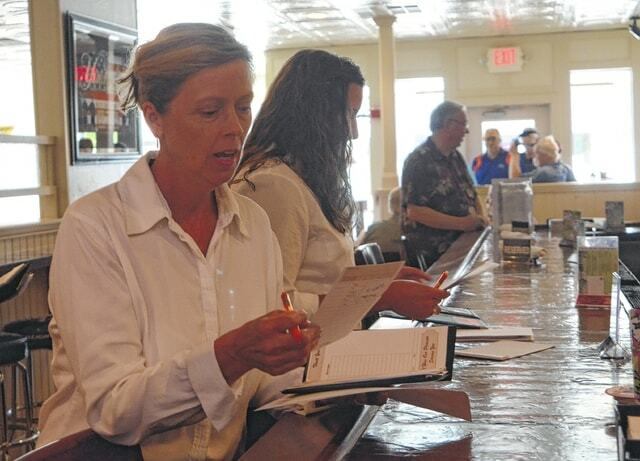 Champaign County Auditor Karen Bailey places a drink order at Coppertop on Tuesday. Several prominent Champaign County residents and officials gathered to wait tables for charity. Champaign County YMCA CEO Paul Waldsmith and his daughter Ellie wait on customers at Coppertop on Tuesday. Several prominent Champaign County residents and officials gathered to wait tables for charity with tips benefiting the Cancer Association of Champaign County (CACC). The CACC raised $3,917 in tips and $725 in raffle ticket sales for a total of $4,642. The event served 189 meals.